This comprehensive book provides the most up-to-date information for students, medical students, and scientists on Zika virus and its associated diseases. It includes all the information related to the Zika virus since its discovery in 1947; its epidemic outbreak in 2007-2014; how the epidemiology changed in America in 2015-2016; its mode of transmission; how to prevent and treat it; and associated diseases. 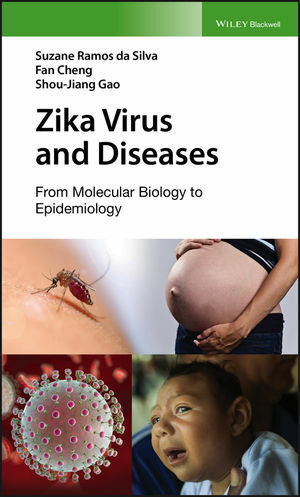 Zika Virus and Diseases: From Molecular Biology to Epidemiology offers complete and up-to-date coverage in 10 chapters. It presents information from papers that attempted to associate the virus with diseases in Africa until the first animal experiment; discusses its association with Guillain-Barré syndrome and microcephaly; describes the basic mechanisms for Zika (ZIKV) replication, including important differences between Dengue (DENV), West-Nile virus (WNV), and ZIKV; explains the difference between the strains and discusses the pathogenesis of them; covers the papers that showed all the interferences that Zika can cause, and the pathways which can be modified; and more. Zika Virus and Diseases: From Molecular Biology to Epidemiology will appeal to graduate students, medical students, basic researchers, clinicians in infectious disease, microbiology, and virology, as well as people in related disciplines interested in learning more about this topic. Suzane Ramos da Silva, Fan Cheng and Shou-Jiang Gao, Department of Molecular Microbiology and Immunology, Keck School of Medicine, University of Southern California, Los Angeles, California, USA.